Vladimir Putin’s war on the West: The Malaysia Airline Flight 17 disaster will not change the Russian president’s strategy. The Flight 17 disaster is just one misstep in the Russian president’s wider war on the West. Russia’s President Vladimir Putin attends a meeting in the Volga River region of Samara, on July 21, 2014. Not since the collapse of the Soviet Union have so many American pundits and journalists offered such varied interpretations of so few signs coming out of the Kremlin. Everybody wants to know: What will Putin do about Ukraine in the aftermath of the downing of the Malaysian airliner? Will he withdraw? Will he invade? Is he in a panic? Is he determined to press forward with his plan to annex eastern Ukraine? The mixed messages coming from the Kremlin have provided at least some support for each of these hypotheses. And all of them are wrong. 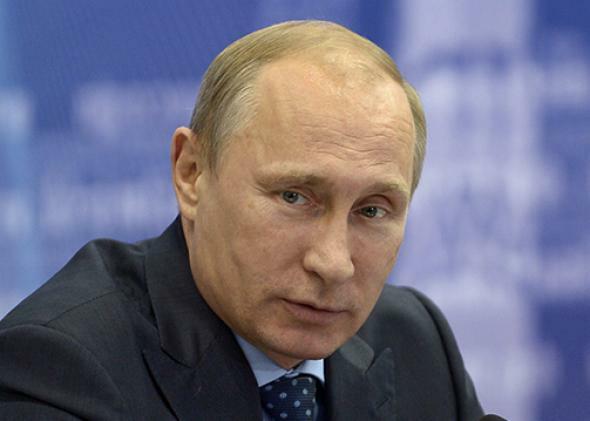 Putin is not going to invade Ukraine or withdraw from it. He is not in a panic. He has not lost his resolve to take eastern Ukraine, nor has it been affirmed—Ukraine has very little to do with this story at all. It’s not Ukraine that Putin has been waging war against: It’s the West. And if you analyze the Russian president’s statements and actions in the past week through the prism of Putin’s great anti-Western campaign, you will find very few contradictions in them—and even less reason to hope for peace. Over the course of two and a half years, since starting his third term as Russian president against the backdrop of mass protests, Putin has come to both embody and rely on a new, aggressively anti-Western ideology. It began with simple queer-baiting of protesters, which included accusing them of being agents of the U.S. State Department, and quickly transformed into an all-encompassing view of Russia and the world that proved shockingly powerful in uniting and mobilizing Russia. The enemy against which the country has united is the West and its contemporary values, which are seen as threatening Russia and its traditional values. It is a war of civilizations, in which Ukraine simply happened to be the site of the first all-out battle. In this picture, Russia is fighting Western expansionism in Ukraine, protecting not just itself and local Russian speakers but the world from the spread of what they call “homosfascism,” by which they mean an insistence on the universality of human rights. Putin knows that in his war against the West he is, in some ways, outgunned: There is the sheer might of the U.S. military, there is NATO, there is, at least sometimes, a united front presented by the world’s richest industrialized nations. So Putin has to be smarter, as he understands smart: Talk a tough line but avoid open confrontation, and hit when no one is expecting him to hit. It worked with Crimea: Putin moved in when no one believed it was possible, and once he had, the balance of power had shifted and he had won. It was working well enough in eastern Ukraine, where Russian-armed and Russian-led armies got to wreak havoc under the guise of locals. Until they shot down Malaysia Airlines Flight 17, turning the underhanded operation into an open confrontation. What various observers have perceived as a moment of truth that changes the mathematics of the Ukrainian crisis is, from Putin’s point of view, a misstep in a conflict with the West that he will be engaged in for years—until he leaves office, which he plans to do feet-first many years from now. It does not call for radical steps; it calls on Putin to be cunning in the way he obfuscates and buys time—two of the very few areas in which he is actually capable of being cunning. To buy time, Putin issued a middle-of-the-night video address from his residence outside of Moscow. Posted at 1:40 in the morning on Monday, it contained generalities and falsehoods—he claimed, for example, to have repeatedly called for peace talks—but what it did not contain was a condemnation of the downing of the plane or any real attempt to distance himself from the so-called separatists. He proceeded to hold an emergency meeting of the Russian security council on Tuesday. When the meeting was called, many opposition-minded Russians expected the announcement of a crackdown: Putin has often used tragic events as a pretext for measures such as abolishing elections or limiting media freedom. This time, however, nothing like that happened and Russian liberals breathed a collective sigh of relief. As far as foreign observers could tell, Putin said nothing of consequence. But here is what he said at the start of his talk: “Obviously, there is no direct threat facing our country’s sovereignty and territorial integrity today, of course. This is guaranteed primarily by the strategic power balance in the world.” Translated, this means, I gathered you here today to remind the world that Russia is a nuclear power. And here is what he said as he was wrapping up: “We will respond in an appropriate and commensurate manner if NATO’s military infrastructure gets any closer to our border, and we will not close our eyes to the development of global anti-missile defense and the growth of supplies of strategic high-precision weapons, both nuclear and non-nuclear.” Translated, this means, Know how I reminded you five minutes ago that Russia is a nuclear power? Now I’ve told you we are prepared to use our nuclear capability if you try to pull one over on us. (He went on to say that missile defense systems were actually offensive weapons.) And by the way, if you every thought we’d stop at something, you probably don’t anymore. The following day, European countries deferred a possible decision on tougher anti-Russian sanctions. The United States released information saying there was nothing linking the Kremlin directly to the downing of the plane. The U.S. media continued to call the disaster a “plane crash.” The acute phase of the aftermath of Flight 17 appeared to be ending. Was all of this because Putin was good at scaring the West or at obfuscating? Whatever it was, his tactics had worked beautifully. Meanwhile, on Tuesday, when he was not busy threatening the West with nukes, Putin signed several new laws. One bans advertising on paid-cable and satellite channels, effectively banning any independent television channel now or in the future from making money. (All broadcast channels are controlled by the state.) Another gives the government the tools to shut off Russians’ access to Western social networks such as Facebook or Twitter and services such as Gmail or Skype. A third provides for a jail sentence of up to four years for denying that Crimea is a part of Russia. On the same day, courts in Moscow and St. Petersburg ruled a half-dozen human rights organizations were “foreign agents,” effectively ending their activities. Putin’s war against the West and its perceived agents in Russia, in other words, continued unabated. As he sees it, the unfortunate screw-up with the plane will be forgotten soon enough. He may or may not have to cede a little on Ukraine, but that’s all right: It’s just one battle in the giant war against the West he has already unleashed.